Cash-strapped Moray Council has revealed its sports and leisure facilities are operating at a loss – despite a membership scheme bringing in almost £850,000 last year. Fit Life was started in April 2015 as an attempt to monetise the authority’s sports, leisure and community facilities. Exclusive new P&J figures have revealed the scheme has brought in £847,504 worth of income for the local authority in 2018. That number is more than £100,000 up on 2017, and an increase of almost £300,000 on 2016. A total of 3,560 members are currently registered with the scheme, with 2,230 of them two adult family memberships which cost £29 per month. 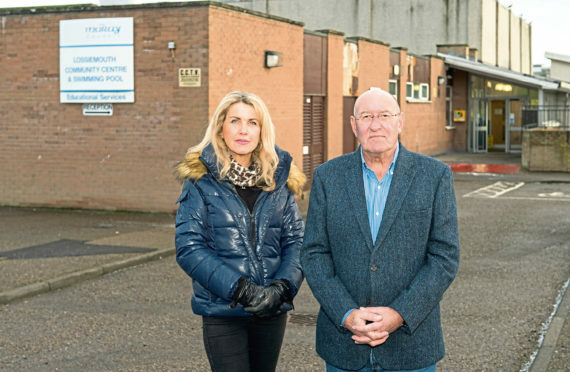 But to save two closure-threatened swimming pools, Moray Council must secure another 300 memberships before the budget is set at the end of the month. The authority last night confirmed that operational costs of their leisure services outweigh the income raised through Fit Life. Both Lossiemouth and Keith pools could be saved however, if 300 additional memberships are secured by February 20, raising £100,000. Council leader Graham Leadbitter said: “Since the Fit Life scheme was launched it has been successful, leading to an increase in money we earn from the leisure services and how they are subsidised. “We still provide a significant subsidy to them though but the more people we can get in the less we can have to spend on that. The leisure services cost the council about £1.5 million a year, and with the added £100,000 from the 300 additional memberships, £950,000 will go towards keeping all the facilities open. Lossiemouth Community Council vice-chairwoman Carolle Ralph said the community is committed to fighting the swimming pool closures. She said: “We are still planning on doing whatever it takes to stop the closure of the pool and the only feasible thing we can do it to get these 300 new memberships so the pressure is on for all our communities. A Moray Council spokeswoman confirmed that the scheme is proving to be popular but stressed the need for new members. She said: “Our Fit Life sport and leisure membership scheme was introduced to encourage regular use of our sports and leisure facilities at a cost-effective and attractive price for residents. Its popularity continued to grow as we expanded the facilities on offer. “However operational costs of our leisure services outweigh the income raised through Fit Life and, as a result of the current financial situation facing Moray Council, councillors made the decision to close Keith and Lossiemouth pools unless 300 additional memberships can be secured by 20 February.